When setting up a greenhouse, one of the first things a gardener needs to decide is whether the greenhouse will be a freestanding or an attached greenhouse. 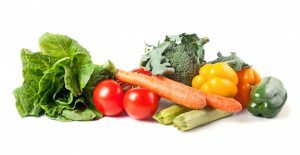 A closer look at some of the advantages and disadvantages of each will give a gardener a better idea of which type of greenhouse will best suit his or her needs. One of the biggest advantages of an attached greenhouse is that they are generally more energy efficient. This is because one wall is already heated by the home. Another advantage of an attached greenhouse is accessibility. Many attached greenhouses are accessible from the living space which makes entering the greenhouse especially convenient. Attached greenhouses can also add aesthetic value to a home. 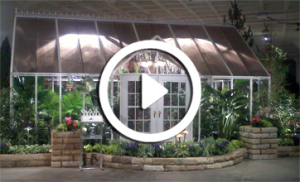 In many cases, a greenhouse will enhance and/or complement the architecture of the home. The disadvantages of an attached greenhouse are that attached structures will require a frost-free footer and a foundation. This can be an added cost to the project. Also, building codes are generally more stringent for structures attached to living spaces. Perhaps the biggest advantages of a freestanding greenhouse are that there are less limitations regarding size, height, and style. Another significant advantage is that freestanding greenhouses usually have better lighting conditions because they can allow light to enter on all four sides of the greenhouse. A disadvantage of a freestanding greenhouse is an increased heating cost during colder months. Due to all four sides being exposed to the elements, freestanding greenhouses are less energy efficient compared to an attached structure. Freestanding greenhouses are less convenient to access because the gardener must go outside to enter the greenhouse. Many gardeners believe that a greenhouse should always be located facing south so that it receives the most light possible. However, this is not always the best location for a greenhouse. Although the southern exposure will receive the most light, the truth is that most plants do not need that much light and, in some ways, a southern exposure can be counterproductive. During the summer months, a south facing greenhouse can easily get too hot and require a shade cloth to help protect the plants. An overheating greenhouse can hinder plant growth and be a nightmare for the grower. For most hobbyist applications, a greenhouse with western exposure is the way to go. Think “west is the best”. This is not to say that other orientations will not work. In fact, an eastern exposure will work just fine for most plants. 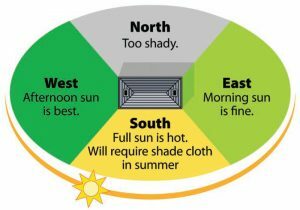 A northern exposure may be too shady for any tropical varieties and is the only orientation that should be avoided if possible. Since virtually any orientation will work, greenhouse hobbyists should choose a location that will best complement the home or garden. Just remember that greenhouses do not need to be exposed to the maximum amount of light at all times. In fact, most horticulturists will want sunnier and shadier locations in their greenhouses to accommodate the needs of the various plant varieties.